The Maricopa Millions Project was started in 2013 with funds from Maricopa County Community College District, with the goal of raising awareness and promoting adoptions of OER by incentivizing faculty to develop, revise, remix, and adopt OER. In order reach as many students as possible, Maricopa Millions focused on creating content for courses with the highest enrollments. This developed content has been publicly shared via Canvas Commons (with the search tag “MMOER”) and promoted within their district at faculty-focused dialogue days and other OER events, such as Open Education Week. Students have benefited from increasing adoptions, and some have even been directly engaged by way of student-focused awareness events designed to teach them how to use our “low-cost/no-cost” filter when searching for classes. The primary goal of Maricopa Millions from the beginning was to remove cost and access barriers associated with traditional textbooks and publisher subscription codes by supporting faculty adoption and development of OER. The commitment of district administration to fund the program was based on the goal that the project would save students $5 million over five years, all while providing students with immediate and permanent access to learning. This administrative support was vital in involving passionate faculty in the process, many of whom were already interested in OER before the outset of the initiative. Cost saving wasn’t the only focus, though. As the project unfolded, Maricopa Millions expanded its efforts to include broader faculty- and student-awareness events in order to maximize the impact of OER where it is most needed–in the classroom. Comprised of ten colleges located across the greater Phoenix area, the Maricopa County Community College District is one of the largest in the country, serving annually an average of 200,000 students. In order to best serve the diversity of students and college cultures, Maricopa Millions was initially comprised of a steering committee including representatives from colleges across the district and led by tri-chairs. Preceding the Maricopa Millions project, various faculty across the district were also working with OER in their classrooms, a grassroots movement that was augmented by the institutional support of the project. Because faculty adoption of OER was (and remains) the single most important focus, Maricopa Millions designed a grant program by which faculty interested in transitioning to open would propose to develop/adapt/adopt an OER course. The grant proposals were evaluating by a rubric that heavily weighed high-enrollment courses and cross-college collaboration (i.e. three or more instructors from different colleges). Participants were funded 3 load hours each (equivalent to a typical class) to complete training in OER, develop the completed course, and then pilot the course. A variety of resources were provided for getting started with OER, including CCCOER, Creative Commons, OER Commons, BC Campus, OpenStax, and Lumen. Maricopa is an OpenStax institutional partner and Maricopa Millions has implemented an “OER Enhancements Fee” to permit faculty to utilize the services of authorized OER enhancement vendors in their classrooms. Faculty were also encouraged to complete Matthew Bloom’s OER Faculty Workshop MOOC: “Making the Transition to Open: The Easy Way to Create, License, and Share Free Materials” (developed separately under a Maricopa Center for Learning and Instruction Learning Grant). Once the training was finished, participants designed and developed their OER courses, providing the tri-chairs of the project with monthly progress updates. After they were piloted, and adjustments made along the way as necessary, courses were shared publicly through Canvas Commons (search tag “MMOER”). Faculty were also engaged through OER events, visits to department meetings, promotional materials, and participation in Open Education Week. The savings calculation was likely our single most impactful tool for maintaining administrative support. 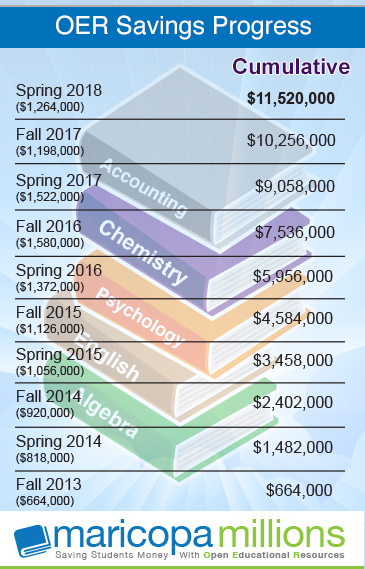 Using a conservative formula for estimating cost savings associated with the “no-cost/low-cost” search code described above, we were able to provide reasonable and meaningful cost savings each semester. 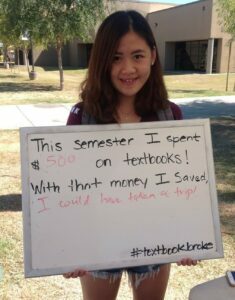 To boost enrollment in OER courses (and to raise student awareness in general), Maricopa Millions also adopted the #textbookbroke campaign and engaged directly with students at different campuses. Faculty participants set up event tables outside of the student center and interacted with passing students about textbook costs and how to search for courses with “no-cost/low-cost” materials. 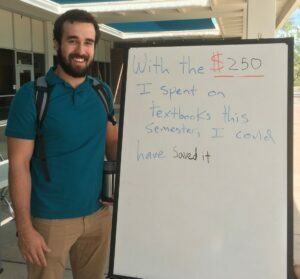 Students were invited to fill out whiteboards upon which were written something like, “With the $____ I spent on textbooks this semester, I could have…” The district steering team also worked with campus OER committees to distribute table tents containing information about OER across the colleges and appealing to students who are also working full- and part-time jobs. These events were not only informative for students but rewarding as unique student-faculty interactions outside of the classroom. The project set out to save students $5 million over five years but ended up saving students an estimated $11,520,000. This by no means only attributable to the more than 20 courses funded and adopted through the nine phases of the grant process; it also reflects the wider campaign for promoting open resources and the continued work of the steering committee and tri-chairs. The great success of the project was possible because of active engagement on all levels–from students and faculty in the classroom to administrative support. Because of this success, the Maricopa County Community College District has decided to “institutionalize” the OER project by creating a Faculty-in-Residence OER Coordinator assignment, wherein a faculty OER champion would receive full reassigned time for 2-3 years to focus on growing OER initiatives throughout the colleges. Currently, the project is evolving to better focus on student engagement and pedagogical innovation in that its grant funding model will encourage faculty to develop, remix, or revise open content according to one or more of the following focus areas: improving accessibility, incorporating culturally-sustaining pedagogies, maximizing “5R” permissions, developing renewable assignments, and enhancing courses with multimedia and interactives.